For the overwhelming majority of investors, portfolios are broadly organized into strategic silos of stocks and bonds, such as the ubiquitous 60/40 balanced portfolio. By design, the strategic proportions of stocks and bonds in the portfolio change very little over time. However, within each silo investors take active risk by choosing to hold individual stocks and bonds in weights that deviate substantially from passive market-cap weights. While some investors make active decisions on their own, many investors delegate their active bets by hiring active stock and bond investment managers via the purchase of funds or Separately Managed Account (SMA) mandates. This article series will consist of a theoretical discussion of Tactical Alpha followed by a series of novel empirical studies. Below, we explore the concept of Information Ratio from the perspective of Grinold’s Fundamental Law of Active Management, which links investment performance to both manager skill and the breadth of available investment opportunities. Next, we provide a brief introduction to our primary analytical tool, Principal Component Analysis, which we will use to quantify the true breadth of an investment universe, after accounting for relationships (correlations) between assets. Following that, we propose a framework, following Staub & Singer, to explore the proportion of total investment universe breadth attributable to asset allocation versus security selection under various correlation assumptions. Subsequent articles will introduce empirical studies, with the goal of quantifying the proportion of breadth derived from a universe of 10 global asset classes (and cash), versus the unexplained breadth introduced by adding first S&P 100 stocks, and then S&P 500 stocks. Following Polokow and Gebbie (2008) we investigate the number of statistically significant independent bets that exist in each universe at each point in time via a rolling PCA factor analysis. Later, we perform a rolling Monte Carlo style analysis of relative breadth by generating random portfolios of assets and stocks similar to the method proposed in Nguyen (2004). Recall that traditional alpha is the residual return from security selection after accounting for a strategy’s beta with a market index or benchmark . Tactical Alpha is somewhat less tangible because there is no obvious benchmark. In practice, Tactical Alpha is often defined as active excess return relative to a policy portfolio, that is achieved through Tactical Asset Allocation decisions. Tactical Asset Allocation is simply active deviation from benchmark weights in the policy portfolio due to changing estimates for risk premia across asset classes over time. Given that Tactical Alpha seeks to deliver excess returns by incurring active risk relative to a policy portfolio, we argue that the Information Ratio is the most appropriate tool to measure value added. Of course, is also used extensively to measure the value of traditional sources of active risk in the realm of security selection. This makes the a practical unbiased ratio for a comparison of these two sources of active risk. It should be noted that the IR and the Sharpe Ratio are equivalent when the benchmark is a risk-free asset. Grinold’s Fundamental Law of Active Management states that a manager’s is a function of both a manager’s skill in selecting attractive investments, and the breadth of independent investments from which he can draw. Breadth is related to the number of independent sources of return available in a manager’s investment universe, and the number of times the manager turns over the portfolio. A manager who executes a strategy on a small but diverse universe with high turnover may benefit from greater breadth than a manager who executes on a large but homogenous universe with low turnover. where represents the Information Coefficient, measured as the correlation between forecasts and outcomes for each bet; is the number of independent bets available in the manager’s eligible universe, and; is the number of times each bet is evaluated in the measurement period. Note that, by substitution, is a measure of a manager’s skill, while shows how breadth is a function of both the diversity and frequency of portfolio bets . In other words, a manager with less skill, but who makes more independent bets, may deliver better risk-adjusted returns than a manager with more skill, but who takes fewer bets. Our goal for this article series is to isolate the impact of breadth on strategy Sharpe ratios. As such, we will assume that managers are able to bring equal skill to bear on any investment universe; that is, we will hold manager skill constant throughout. This is intuitive because there is no reason to believe that managers operating in one universe, say stocks or bonds in a specific geographical market, are any more or less skilled than managers operating in a other universes, such as global asset classes, geographic market indexes, or sectors. In his original paper, The Fundamental Law of Active Management, Grinold equates the number of independent bets with the number of securities in a manager’s investable universe. For example, a large-cap equity manager may be restricted to investing in securities in the S&P 500, so he has 500 securities to choose from each time he makes a `bet’. In contrast, a tactically oriented investor who focuses on asset allocation may choose between, say, 10 major asset classes. By extension from Grinold’s interpretation, and assuming similar skill and turnover for both managers, the tactical manager would be expected to have an of of the of the large cap equity manager. For the purpose of consistent nomenclature, we will call this ratio the Information Ratio Multiple (IRM). Thus, the IRM will quantify the square root of the number of independent bets in an investment universe. Unfortunately, Grinold’s interpretation makes the strong assumption that the 500 securities in the stock-picker’s universe, and the asset classes which comprise the tactical manager’s universe, represent `independent bets’. However, this interpretation implicitly assumes that the securities in the specified universe are independent – that is, uncorrelated. That’s because if two bets are positively correlated, they are definitionally not independent. This is easily demonstrated by taking an extreme example of two securities which are 100% correlated. If we apportion weights to the securities in a portfolio so that they contribute equal volatility, the portfolio of two securities would behave precisely as though it held either of the two securities on its own. Obviously in this case, despite there being two securities, there is really just one bet, and a manager with skill would have no opportunity to earn excess returns by choosing between them. On the other hand, if the two securities are completely uncorrelated, the combined portfolio would behave quite differently than either of the securities on its own, and a manager skillful manager would have an opportunity to be rewarded with excess returns. Of course, stocks in a given market are almost always positively correlated, while correlation between stocks and bonds may be positive or negative at different times. In fact, over the past 20 years, individual stocks in the S&P 500 have tended toward a pairwise correlation of 0.35 with a 95% range of 0.1 to 0.65, while stocks and Treasuries have averaged a correlation of -0.1 with a 95% range of -.65 to +0.6. As we will see, the fact that correlations deviate from Grinold’s assumption has important implications for managers’ potential to generate high risk-adjusted performance in security selection versus asset allocation. 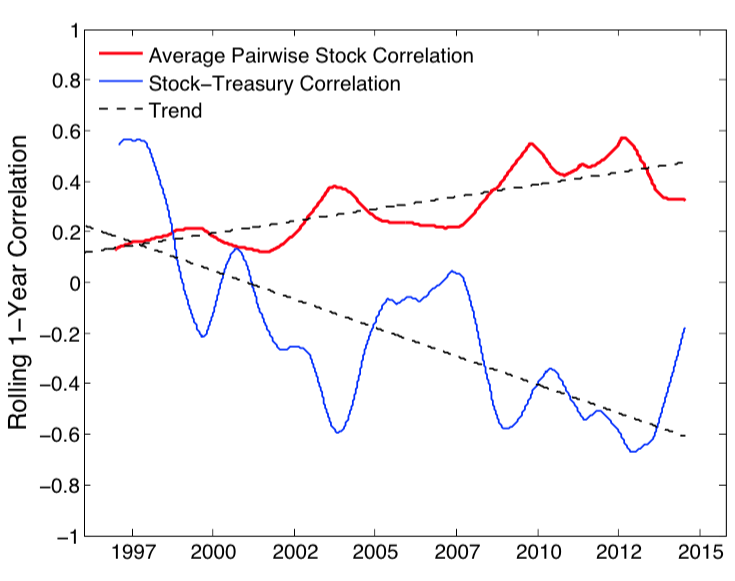 Furthermore, if the trend over the past 20 years continues, stock correlations may continue to rise while stock and bond correlations decline, per Figure 1, with important implications for trends in marginal breadth. In the next article, we will introduce our instrument of data torture, Principal Component Analysis, and demonstrate how we can use this tool to quantify the number of statistically significant ‘bets’ in any market. Later, we will use these tools to demonstrate why a small universe of asset classes can offer greater breadth – and commensurately a larger potential opportunity for alpha – than a much larger, but homogeneous, universe of individual stocks. Experts Aren't Helpful, and Other Useful Lessons From "DIY Financial Advisor"